My husband got me to Nova Scotia only because I learned that Quilt Canada, Canada’s equivalent of NQA, was being held in Halifax in June. The show was actually several shows – miniature quilts based on the theme “Seams Like Home” (what is it with quilters and bad puns? ), the juried show, quilts by instructors and quilt committee board members, art quilts by FAN, a west Canada group, and Secret Codes – quilts by black Nova Scotian quilters. Yes, Nova Scotia has communities of blacks – descendants of black loyalists from the colonies. 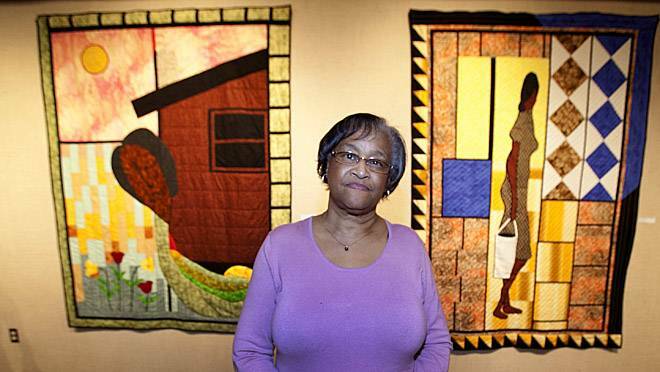 This is Marlene Dorrington in front of her quilts at the Secret Codes show. I took pictures at all but the juried show. Photography wasn’t allowed there, but you could buy the catalog for $10 Canadian and a DVD of photos for $20 Canadian. Since the catalog pictures were woefully inadequate and I thought $20 was too much for a DVD of maybe 100 quilts I took notes instead. And you know what, I think they’ll help me more than pictures. Use small yoyos for borders. 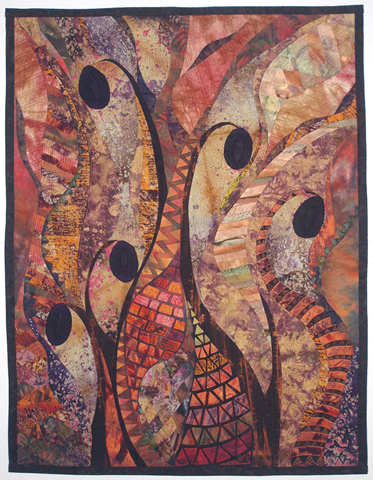 One appliqued quilt was made up of yoyos of all sizes, sewn together to make the figure of a dancing woman. And the border was yoyos without any binding. Use old damask table cloths for fabric. One piece with lots of fabric dyeing and painting took advantage of the patterns woven into old cloths. I have some damask table cloths and napkins that are stained and really not suitable for festive meals but I couldn’t throw them out since they were my mother’s. Now I have a way to repurpose them. Selvedge mummy. One quilter cut off hundreds of fabric edge strips and created a mummy wrapped in them. The border was wonky blocks of Halloween fabric edged with selvedges. Very whimsical. English paper piecing “flowers” combined into tree with leaves, etc. The quilter surrounded flower centers with other hexagons and then used these to suggest clumps of leaves. Curved piecing – Gloria Loughman. This teacher was mentioned in a quilt description. Found out she’s Australian. Use diagonal stripe flange. Really effective with black/white fabric. Color black/white fabric print with fabric markers/paint. A quilter had created a unique fabric line out of one print and made her quilt look like it used several fabrics. Torn raw edge strip pieced landscapes – torn edge applique on base of Timtex. I found the link to your blog from my website StatCounter… It is great to be on your list of interesting quilts at the Quilt Canada show! I have some ‘in process’ pictures of the Torn strip applique landscapes I will send you. I was sorry I couldn’t take the class you offered at Quilt Canada on the torn strip technique, but I had just one day for the show. I’d love to see more examples of this technique. The Cape Breton coast seems like the perfect inspiration for a quilt made with your method. I am teaching in Saint Andrews, NB in August. Where are you? Since I’m in Ohio, USA, I don’t think I’ll be attending your St. Andrews class, alas. Have you ever ventured south of the border?